As stories go, Valerie Jardin’s is fairly common: raised in France, moved to the United States, buys a camera, opens her own studio, and becomes a highly acclaimed international photographer. Through the years, Valerie has parlayed her love of photography into teaching, podcasting, speaking, writing, and exhibiting. This is her story. Raised just outside of Lisieux in Normandy, in the northwest region of France, Valerie Jardin grew up appreciating the value of the arts, photography being one of them. Admittedly, she really wasn’t interested in photography at the time even though she had a few 110 and point-and-shoot cameras growing up. Her teachers didn’t seem encouraging of any artistic inclinations while at school. However, home was a different story. You see, when most adolescents had posters of rock stars in their bedroom, she had the photographs of famed photographers Henri Cartier-Bresson and Robert Doisneau adorning her walls. Valerie went on to attend the University of Caen to pursue a Bachelor of Arts in English with an emphasis in Linguistics. She wanted to teach English as a second language. As part of her program, she was awarded a full scholarship to study for a year at Colby College in Waterville, Maine. After going back and graduating from the University of Caen, she went on to the Eudine European Business School and received a degree in International Business. After graduating, Valerie used her business acumen and linguistics training to work as an international translator for French and English publications. She did this, but life has a funny way of throwing curve balls once in a while. Valerie’s first interest in photography came after discovering the work of National Geographic photographer Jim Brandenburg. Because of his work on the Minnesota prairie, Valerie was inspired to pick up a camera and make her own photographs. Her first serious camera came in 1998 when she bought a Canon EOS Rebel 35mm camera. That opened the door to her photographic endeavors, something she would be working on ever since. Later in her career, Valerie was able to meet Jim and the two been friends ever since. Following in the footsteps of other successful photographers, Valerie is self-taught. She learned about aperture, shutter speed, ISO, composition, and everything else by simply asking questions, reading the masters, and experimenting with the camera. After realizing her interest in photography was the next step in her professional career, Valerie took some formal lighting and post-processing classes and then finally opened her studio in 2002. Through her in-home Minneapolis studio, Valerie would regularly shoot portraits for clients, inevitably progressing to food photography and interior photography. She was growing herself as a professional photographer in the region. So was her love of street photography, a totally different type of creative adventure. After growing her business as much as she could, Valerie decided to expand it to include photography workshops. In 2012, Valerie offered her first workshops in Paris, France. The goal was to help students learn to see photographically and teach them the ins and outs of street photography. Since then, Valerie has taken her camera all over the world teaching students the art of storytelling and seeing photographically in places where the people and streets abound: Paris, New York, Rome, Amsterdam, Melbourne, Normandy, San Francisco, Minneapolis, and Vancouver. Although she calls the Twin Cities home, on average in any given year she logs 80,000 miles flying all over the world. Valerie Jardin never sits still. She is always on the go and loves to try new things. Apart from teaching, Valerie has written nearly 100 articles for Digital Photography School and other publications, contributes to numerous podcasts, writes books, updates her blog, and records her own photography podcast called Hit the Streets with Valerie Jardin. She also sells fine art prints on her website. Valerie’s talent as a photographer and skill as a business owner caught the eye of Fujifilm USA and in 2015 she became an official Fujifilm X- Photographer. In this role, she speaks at photo-related events all over the country and reviews new Fuji equipment. The latest moniker added to Valerie’s repertoire is book author. “Street Photography: First Steps and Beyond” was self-published in 2016, "The Art Of Seeing Photographically" was published in August 2017 and "Street Photography: Creative Vision Behind The Lens" was released from Focal Press/Routledge in the Fall of 2017. At the heart of Valerie’s work, though, is a talent to make beautiful photographs and teach others to find their photographic vision. Her work has been on display in various media outlets and inspires others to follow their passion. What’s next for Valerie Jardin? Put on a comfortable pair of shoes and follow along. There’s room enough for everyone on her photographic journey. Although I have worked with DSLRs in the past, I now shoot exclusively with mirrorless Fujifilm equipment. Workshops are either week-long or held over 2-3 days, usually on the weekends. I provide hands-on teaching and photo walks that immerse students in the art of seeing photographically and street photography. I also provide critiques of each student’s work. Paris, France - Normandy, France - Barcelona, Spain - Berlin, Germany. Private instructional photo walks and workshops where students benefit from one-on-one guidance in the field. Critiques online via Skype or Google+. I view street photography as candid or social documentary photography that includes people, or the idea of people, in a public space. “Street” doesn’t mean the literal street, too. Rather, the human element can be in a public area, like the beach or inside a building. Photographers need to shoot with more intent and make decisions before they press the shutter. By learning to see photographically and taking control of their camera, photographers will be able to draw the eye to the subject and express their vision more effectively. A short training video that focuses on just one neighborhood to provide tips on street photography and shows how professionals shoot famous cities, like San Francisco. “Hit the Streets with Valerie Jardin”. September 2016 – present. “Street Focus” This Week in Photo (TWiP). 2014 – 2016. 104 episodes total. From Routledge, this book follows the author on a photo walk around the world. It demonstrates a variety of approaches to envisioning an image, outlines the available choices, including the specific angle, the settings, and what might spur someone to click the shutter at that decisive moment. Readers learn to find a stage, to be an observer, to be part of the scene and discover the elements that make a strong photograph. This book is available via Amazon.com and from your local bookstore. A 76-page e-book is designed for beginner to advanced street photographers. Helps readers get started in street photography as well as giving them tips to step up their game in order to make stronger images. The e-book is available at https://gumroad.com/l/jGVpl. Color or Black and White for Street Photography? What Would Help Improve Your Photography? Can Photography Become an Addiction? In 2015 and 2016, I was voted one of the top 20 most influential street photographers by Street Hunters (a crowdsourced international survey). West Photo in Minneapolis. October 21, 2017. Topic: "The Unobtrusive Street Photographer"
Minneapolis Photo Center in Minneapolis, Minnesota. 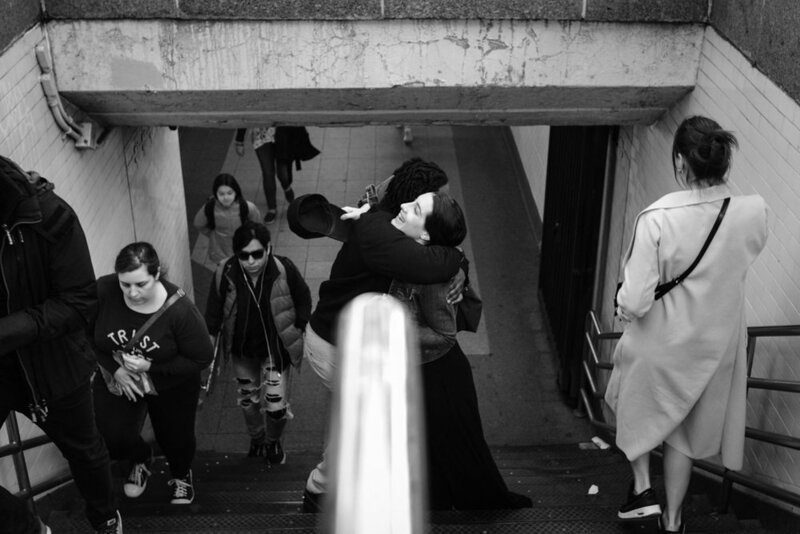 June 8 - August 18, 2018 Photographic essays by Valérie Jardin featuring the work of Joshua Coombes on the streets of NYC and Paris. Minneapolis Photo Center in Minneapolis, Minnesota. A solo exhibit that featured my street photography of Paris, France. A still life and street photography joint exhibit with Dutch photographer Klaas van Huizen. Over the years, my work has also been exhibited in small, local galleries and group shows around the Minneapolis area. In addition to these art exhibitions, my work has been featured on the cover of the July 2016 issue of Fuijilove Magazine, in the March 2016 issue of MonoPix magazine (in print and online), and in a full-page back cover advertisement for Fujifilm in the September, 2016 issue of Shutter Magazine. The day I picked up a camera I became a storyteller. I learned to see the extraordinary in everyday life. And my passion for documenting humankind has led me to find beauty in the most unlikely of places. As a visual storyteller, photographic images are how I tell these stories. Chasing light is my desire, my obsession, my addiction. The camera is an extension of my vision. It captures what I see. Images help me tell the story of the light I chase in the urban landscapes I visit. Every time I make an image, I capture a moment in time that will never occur again. Each frame I shoot becomes extraordinary in its uniqueness. The people. The architecture. The light. The shadows. When they come together, they form the stories of the cities that I want to show my students. My love of humankind drives me to wander the city streets tirelessly to capture the candid moments of daily life. These are the everyday moments most people would not see. These are the moments I want to find and tell. I thrive on searching and waiting for just the right moment when a story unfolds in a single frame; where context and subject intersect with me there, honored to tell its story to the world. And I am happiest when I get lost on purpose, and let the city reveal its magic to me. The urban landscape is always surprising me with the new stories that unfold throughout the day and into the night. With this, photography continues to change my life. "This was my second workshop with Valerie, having done a week in Rome 18 months ago which changed my photography for ever - I learned a huge amount! Valerie is extremely positive, encouraging and approachable and works so hard with all her students, adapting her teaching to suit their personalities and differing levels of experience. She is expert at revealing the essential and contrasting styles of the host cities to our lenses, and the workshops are very well planned and organised while there's also plenty of scope for variations if the group wishes for that. I came away from this recent weekend with a wide range of images of Paris and its people that will enable me to illustrate the story of my visit. Listening to Valerie describing the visual opportunities at each location is a rich source of artistic inspiration and practical learning & revision for anybody, and so I strongly recommend her workshops to any street photographer, novice or experienced." — Mark, UK. "Like other reviewers of this book, I am an alumnus of several of Valerie’s workshops and don’t have much to add to the extravagant-- and fully justified-- praise of her workshops. She is a remarkable photographer and teacher. Her boundless enthusiasm, generosity, and search for meaning in the images she takes is inspirational. "The first part of the book is an overview of methods used in street photography. She discusses her approach to street photography, which is good since I have no idea what I'm doing in that regard. There are some standard photo techniques, a bit about legal issues, and some assignments to try out. This is all good stuff, and it got me hungry for more. There were some great pointers about street photography, and the assignments gave me ideas on how to start. And then there is the second part of the book... The decisive moment clearly shows in all her work, and it's the second part of the book where you get the feel of workshop excitement. Do you know that part of a workshop where you've met everyone, you've talked a bit, you've seen some examples and you're ready and raring to go out and shoot shoot shoot? That's the entire raison d'être of this part of the book. Valérie shows you an image, then walks you through her thinking process when she created it. I felt I was walking with her, thinking about the subject in front of the camera, trying to capture that feel, that light, that magical moment. She speaks of personal feelings (the loneliness she felt when a friend could not meet her), the challenges of waiting for the right subject ('Several tourists entered my frame, but none were interesting enough...'), the satisfaction of capturing something special ('It never gets old!'). This is what makes reading her book and viewing her images inspirational... those stories behind the work that become a part of the vision and give it that personal touch that makes an image extraordinary. Review on Pix International, LLC: From front cover to back, photographer Valerie Jardin’s new photo book is a winner!